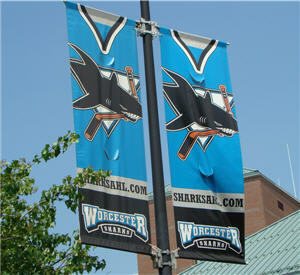 The New England Sports Center in Marlboro is hosting the first 2010 preseason game for the Worcester Sharks. They will be playing no other than the Providence Bruins at 7pm tonight. It is weird to think of hockey on a day where it is in the mid-70s but this is a great opportunity to see the Sharks in a more intimate environment than the DCU center. Tickets are only $10 as can be seen on their official flyer for the game. If you are not from the Central Mass area you may not be familiar with the New England Sports Center. The center holds 5 indoor skating rinks and is home to many National Youth Hockey practices and events. It is also home of The Skating Club of Boston which promotes both recreational and professional level figure skating. If you are unfamiliar with the youth hockey circuit you know that ice skating facilities can run the range, with many rinks not offering many amenities and usually not much in the way of heat. My favorite part of the New England Sports Center is the heated, ice-viewing area. As a spectator that definitely allows you to enjoy the events much more. Hockey is also now not just a male sport with girls hockey increasing both in popularity and participation. The NESC is home to both the Minuteman Flames and the Minuteman Lady Flames. Check out a list of all New England Sports Center Events here. As for the Worcester Sharks though their season starts on October 9th you won’t be able to catch them at home at the Worcester DCU until October 23d. Tickets for the 2010-2011 season are on sale now.